In this following task, I have tried to create a visual metaphor, which will be the foundation for the task. First, I will shortly explain, how to interpret it, and then proceed to map out the metaphor. Secondly, I will briefly discuss whether it is a monomodal or multimodal metaphor by using Forceville (2006). Also, there will be a short reflection on, how the metaphor would appear, if I convey it into another medium. Finally, I have done a small qualitative pseudo-survey by asking three friends about the interpretation of my visual metaphor, and I will present the results in parts of the discussions. My visual metaphor is about one of the main sports in the world, where I have tried to evoke certain cognitive aspects, which is familiar with cycling sport. My intention was to evoke the metaphorical interpretation; cycling is doping. I used two known entities to shape this meaning in the picture. I will shortly map out by using TARGET FOR A IS SOURCE B (Forceville 1998). In recent years, professional cycling has had various doping scandals. Therefore, I used a cycle as target, but just not any cycle, instead I used a Time Trial cycle, which is deeply connected with the sport. Therefore, it could not be seen as random street bike in Amsterdam or Beijing. For the source B, I choose a syringe, which often is connected with medical treatment, and syringes are good, when used in cases of sickness, but not when used for improving performance. Thus, a form of discrepancy would occur, because it is a part of the bike. Therefore, the cycle is a metonym for cycle sport, and syringe is for doping. 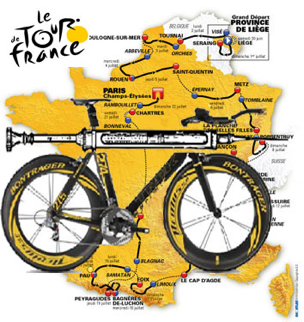 Also, the pictorial context is a map, which is showing France and the 21 stages in Tour de France, and it is one of Europe’s biggest sport events, where more than 80 % of the population in various European countries know it. Therefore, the logo ‘Tour de France’ is in some way unnecessary to present the event. However, my literal suggested metaphor is: THE CROSSBAR ON THE BIKE IS A SYRINGE. My idea was that the connection would give people the more abstract metaphorical interpretation: BICYCLING RACE IS DOPING. Interestingly enough, my interviews could more or less confirm this interpretation, where two of the participants saw the connection between cycle and syringe, and they could confirm the idea by saying: PART OF CYCLING IS DOPING. However, the third informant used the pictorial context as part of her interpretation and said: TOUR DE FRANCE IS DOPING. Also, she remarked that her knowledge only stretched to Tour de France and not the sport in general. My metaphor was presented as a single gestalt, and should be understood as a hybrid, where the pictorial context only should enforce the metaphor, but I would call my metaphor a Hybrid or MP2, where the removal of pictorial context would not interfere in the interpretation (Forceville 1998:163). However, an informant suggested that the logo could be removed, and the picture metaphor would still be clear. Also, the three informants were agreeing that removal of both logo and pictorial context could disturb the metaphor. However, they were not agreeing on to what extent, this would occur. Therefore, we see that cultural background knowledge plays a big part in the interpretation of the metaphor, which leads me to the discussion; is it a multimodal or a monomodal metaphor? Charles Forceville discusses multimodal and monomodal metaphors, and a tight definition of multimodal metaphors is derived from his paper. Where they have their target and/or source represented exclusively or predominantly in different types of modes (Forceville 2006:384), where modes are different ways of communicating a message, and he is defining nine different kind of modes (Ibid. :383), of which the most interesting modes are pictorial signs and written signs, because they are represented in my picture. If we take a closer look at my metaphor it consists of two pictorial entities (signs), which are the bike and the syringe. Next, the pictorial context also can be considering a sign, but it is not part of the metaphor. Finally, we have the logo from Tour de France. It is written, but also contains a metonym of cyclist replacing the OUR in TOUR. When we look at the responses of my informants, the clear thing is that they can locate target and source and distinguish them from context and logo. Also, the logo only enforces the pictorial context, but it is not a part of target or source. Therefore, if we leave out the written mode (logo), the metaphor still stands, although some people could have difficulties to depict target and source. However in Europe, the doping problem has been a major issue for the last 15 years and it has played a considerable part in the news during the last decade. Therefore, the time period plays a part in the interpretation; where doping and cycling were not so easily connected in the early 90s [yes]. Therefore, the metaphor/ target and source are depicted in pictorial signs, and consequently, I would call it a monomodal metaphor. However, if we conveyed the metaphor into a multimodal metaphor, we would have to think in how target and source could be represented, and how they change in a new medium. For example, a satirical cartoon could use the effects of gesture, and sounds. If we have a cyclist that is using a gesture that reminds us of syringe, we would probably need a sound that could remind us of an injection, even though this in reality does not have a sound. It could be a sound from a gas pump that would remind us of refilling and renew a cars energy level. The target would still be the cyclist/cycle, but the source would be deriving from to modes: sound and gesture. This would consequently make a bit more difficult to verbalize it literally in a metaphor suggested by Forceville. However, again the interpretation would demand certain knowledge about injections, which Forceville agrees with, when it comes to multimodal metaphors (Ibid.:388). Moving image is known for twisting the target and source unlike advertisement, and also advertisement would rarely use MP2 for their products (Ibid:393). However, the cartoon of the cyclist doing injecting gestures would probably be easy to comprehend, because it would be presented in a certain genre such as a satirical genre. Where people would combine knowledge with genre, and then know it is a satirical statement. Therefore, the multimodal metaphor would be understood as: CYCLING IS DOPING/ CYCLISTS ARE DOPING USERS. However, it seems that individual knowledge, signs, and medium can challenge our ability to find target and source, and secondly they will play a vital part, when we do a metaphorical verbalization of target and source.